In-depth profiles of 18 major suppliers with a comprehensive look at their product and pricing strategy, manufacturing and export capability, verified contact details, and more – this information is not available anywhere else. The wicker baskets industry in Vietnam is adopting strategies to boost the management of raw materials and design capability of suppliers. Trade associations, individual manufacturers, the national government and various stakeholders have established a program whereby the basketware sector is provided means to ensure the availability of inputs such as bamboo. This approach, along with a few others, is expected to further develop the industry, which has been registering fluctuating overseas revenue in recent years. Economic difficulties in key markets abroad have resulted in declining demand for nonessential products such as handicrafts. The US and the EU remain to be the largest foreign destinations for Vietnam-made wicker baskets. To supplement flat revenue from these locations, makers plan to expand their reach in the Asia-Pacific region in 2014. 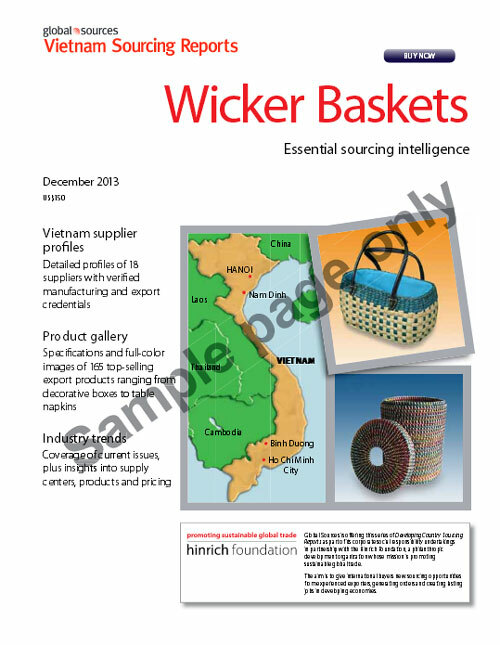 This report focuses on the main types wicker baskets from Vietnam – bamboo, rattan, natural material and plastic baskets. "I found the reports utterly useful and beneficial in helping me source more effectively and efficiently"
"China Sourcing Reports have helped us to focus our search in China and give our clients the best answers about suppliers potential." "CSRs are good, time saving, cost efficient and have very interesting additional information needed for sourcing." China Sourcing Reports are in-depth studies that concentrate on specific sourcing industries in greater China. Each report contains a comprehensive industry overview, in-depth supplier profiles, photo gallery of top-selling products and other market information that is not readily available anywhere else. For buyers looking to source from beyond Greater China — Vietnam, Cambodia, India, Nepal, Myanmar, Indonesia and the Philippines — we offer you the Developing Country Sourcing Reports. These 'Rest of Asia' reports provide new verified suppliers who may complement or provide alternatives to your current sources. 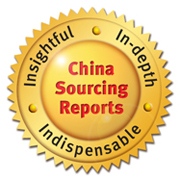 These reports are offered as added value to the Global Sources buyer community, and follow the trusted China Sourcing Report format. - To produce these reports, we interviewed a wide range of companies. Rather than focus on high-profile makers, we compiled a representative sample of large, midsize and emerging manufacturers. All profiled companies are export-oriented professional suppliers that are verified by us. Each supplier is confirmed to be authentic with a legally registered business. - Although mainland China is the focus of coverage, suppliers from Taiwan, Hong Kong, and South Korea have been included in reports where production has not shifted primarily to the mainland. - For each company profile, our research teams interviewed senior executives and export managers who discussed their recent performance, and production and export capability. The interviews were done by phone or e-mail. - In each case, companies were required to answer specific questions designed to verify their manufacturing and export credentials, including a breakdown of exports by product type and market. - All suppliers were asked to participate in a survey designed to provide insight into price trends, sales outlook, target markets and challenges in the next 6 to 12 months. These are discussed in the Supplier Survey section in each report. - A product gallery containing images and detailed descriptions of a range of top-selling products from profiled suppliers is also included. - The Developing Country Sourcing Report series is part of Global Sources' corporate social responsibility initiatives. It is offered in conjunction with the Hinrich Foundation, whose mission is promoting sustainable global trade. One of its objectives is to help create jobs in developing Asia through export promotion. - The series covers several emerging economies in Asia, including Vietnam, Indonesia, the Philippines, India, Cambodia, Nepal and Myanmar. It is designed to provide buyers with information on new products from export manufacturers that specialize in handmade merchandise. - To produce this report, large midsize and small manufacturers, all with substantial export experience, were surveyed. The selection of suppliers is designed to reflect the composition of the industry in the country of coverage in terms of geographic location, materials used and range of products offered. - For in-depth profiles, our researchers visited the facilities of each company and interviewed senior executives who discussed their recent performance and provided forecasts for the next 12 months. All other makers were either visited or contacted by phone. - In each case, companies were required to answer specific questions designed to verify their manufacturing and export credentials, including a breakdown of exports by product type and market. Suppliers also participated in a survey aimed at providing insight into price trends, sales outlook, target markets and challenges. - A product gallery containing images and detailed descriptions of a range of top-selling products from profiles suppliers is also included.